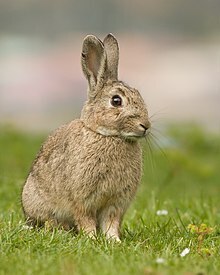 The lagomorphs are the members o the taxonomic order Lagomorpha, o which thare are twa livin faimilies: the Leporidae (maukins an kinnens) an the Ochotonidae (pikas). The name o the order is derived frae the Auncient Greek lagos (λαγώς, "hare") +morphē (μορφή, "form"). Thare are aboot aichty-seiven species o lagomorph, includin aboot twenty-nine species o pika, twenty-aicht species o kinnen an cottontail, an thirty species o maukin. ↑ 1.0 1.1 Hoffman, R.S. ; Smith, A.T. (2005). "Order Lagomorpha". In Wilson, D.E. ; Reeder, D.M. Mammal Species of the World: A Taxonomic and Geographic Reference (3rd ed.). Johns Hopkins University Press. pp. 185–211. ISBN 978-0-8018-8221-0. OCLC 62265494. ↑ "lagomorph | mammal". Retrieved 2015-08-15. This page wis last eeditit on 18 Februar 2017, at 18:40.